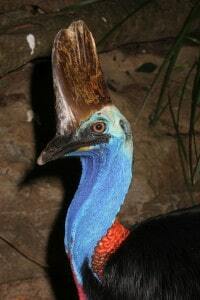 This region’s largest and most spectacular bird is the Southern Cassowary. Although they are solitary for most of the year, these primeval flightless birds seek out a mate at this time of year to breed. It is one of the few times of the year that female is tolerant of a male. Pairs form for a few weeks until a nest site on the rainforest floor is found. Three to five olive-green eggs are laid in a shallow depression in the ground lined with grass, ferns and leaves. The male is left with the responsibility of incubating the eggs for two months without leaving to find food, and then raising the young for up to nine months. The female leaves after laying her eggs and may even mate with several other males in a season. This is referred to as polyandry. adult develops the glossy black plumage of a mature bird.